Train conductors and engineers at Canadian Pacific Railway, Canada’s second-largest railway company, went on strike this week, bringing shipments to a halt. The railroad workers were asking for more predictable schedules to combat crew fatigue, among other demands. Chief Executive Keith Creel said in April that the railway wouldn’t be “taken hostage” by demands that would interfere with the company’s operations. The strike is the railway’s second since a brief one in 2015, when workers opposed operating and work changes imposed by the railway’s former CEO, the late Hunter Harrison, under his so-called precision railroading strategy. Despite Creel’s tough stance, the company did reach a new tentative agreement with conductors and locomotive engineers to resume service on Thursday morning. Though tentative, the deal means the strike is over — for now at least. The strike was the latest blow to grain, crude oil, forest product and mining producers, who experienced significant shipping delays over the winter months as Canadian Pacific and its rival, Canadian National Railway, struggled to keep up with an unexpected surge in demand for oil and other commodities. Canadian Pacific is a leading shipper of grain in Western Canada and the northern plains of the U.S and also a major shipper of crude oil and fracking sand. Hence, any stoppage of its rail service causes potential economic harm. Unlike the previous Conservative government which would introduce back-to-work legislation whenever a labour dispute disrupted activities at federally-regulated companies, the incumbent Liberal government did not step in this time. 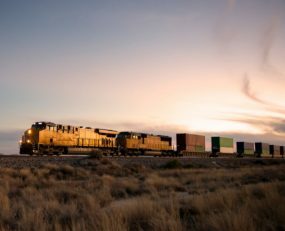 As rail in North America continues to lose market share in the freight industry, with shippers getting increasingly frustrated by poor service and tight capacity, the strike is a painful reminder of the poor state of the North American rail freight industry. Some shipper organisations have taken their frustration over rail service and insufficient capacity to Washington. The National Grain & Feed Association expressed concern that the underlying root cause of the service problems lay in the rail firms’ effort to reduce their operating ratios to impress Wall Street investors and shareholders, which resulted in the “systemic shedding of resources”, which has “degraded service to unacceptable levels” and “resulted in virtually non-existent surge capacity to meet rail customers’ needs”. Given the constraints on trucking in North America, shippers would welcome the opportunity to move more of their traffic by rail, however, many feel they have no choice. The Intermodal Association of North America registered 7.2% year-over-year increase in intermodal volumes in Q1 2018, the strongest gain since Q2 2014. The strong demand means that rail operators find themselves in a sellers’ market and feel little pressure to make investments to improve their service. Moreover, rail is a low margin business so justifying large investments can be hard. Overall, the outcome of the poor rail freight service, tight capacity, and labour disputes which have ground half of Canada’s rail freight capacity to a halt, is a shift of cargo away from rail to road, with trucking companies likely to see their activities increase as a result. Interestingly, these developments in North America’s rail freight sector coincide with the EU’s ‘Year of Multimodality’ which should encourage a push for pan-European rail freight. Despite the issues the persist in Europe’s rail freight sector, the EU Commission is pushing further for rail freight development, with the ultimate goal to lessen the region’s truck dependency.